Our aim is to contribute to the international Human Rights movement based on our research and professional experience in the health sciences. Health concerns are an important area in the HR-international mission that has, unfortunately, been neglected as primary focus by most of established HR NGOs. We have chosen to undertake this endeavour from an independent platform, as a new established organization independent from government or partisan-politic interests. We act upon the basis of the UN chart of human rights and the ethical norms of the World Medical Association. We seek no sponsoring from any institution. We are totally independent from government, and we will not receive any financial support from governmental or corporative entities. We believe that poorly-defined stances by Sweden in a variety of international conflicts in recent years, added to a growing proximity to NATO, have impacted the content and direction of Sweden’s human-rights agencies, both governmental and NGOs that are financed or partly financed by the government. Our purpose is to increase awareness of the atrocities of war on civil populations and corresponding impact of war crimes on a wide range of health issues including the epidemiological spread of disease, the traumatic physical and psychological damage to individuals, families and populations, and the risks and challenges of providing medical aid to victims in dangerous conditions. Additionally, we strongly oppose the governmental assaults on the human rights of individuals who have denounced war crimes or exposed serious infringements to the civil liberties of the population. We are dedicated to RESEARCH and REPORT and we wish that our contribution, however humble, shall help towards restoring Sweden’s honourable place as a leading defender of human rights. During the half-century prior to the as yet unexplained assassination of Prime Minister Olof Palme, Sweden had occupied a world-prominent place in pursuing peace between nations and supporting respect for human rights, corresponding with Sweden’s position of neutrality and non-alignment. This neutrality was never conflated with unresponsiveness towards the perpetration of war crimes and infringements of people’s basic human rights. Examples of Sweden’s past stance against human rights violations include Sweden’s official position regarding the U.S. aerial bombardment on Vietnam civilians and the Soviet government’s invasion in Hungary and Czechoslovakia. Geopolitical events in the 90’s, symbolized by the fall of the Berlin Wall, drastically changed the content of the non-aligned movement in world affairs. Since the cold war was supposedly ended, the issue of alignment VS. non-alignment with opposing superpowers seemed no longer of any concern. Sweden became less and less “neutral” and deepened progressive cooperation with the only surviving superpower, the U.S. This change in the geopolitical stance of Sweden conveyed sad consequences for countries in the Third World, where the leading role of Sweden in the nonalignment movement had been undisputed and deeply respected. Instead, over the last decade, these countries witnessed the unexpected military participation of Sweden, under US-military command, in events such the occupation war in Afghanistan and the aerial bombardment in Libya. A clear expression of the resulting lack of regard by Third World countries for Sweden’s record on Human Rights was the 2012 vote to fill seats in the UN Human-Rights highest board, the Committee. Despite a long and hard campaign by the Swedish Ministry of Foreign Affairs, Sweden received the fewest number of votes. 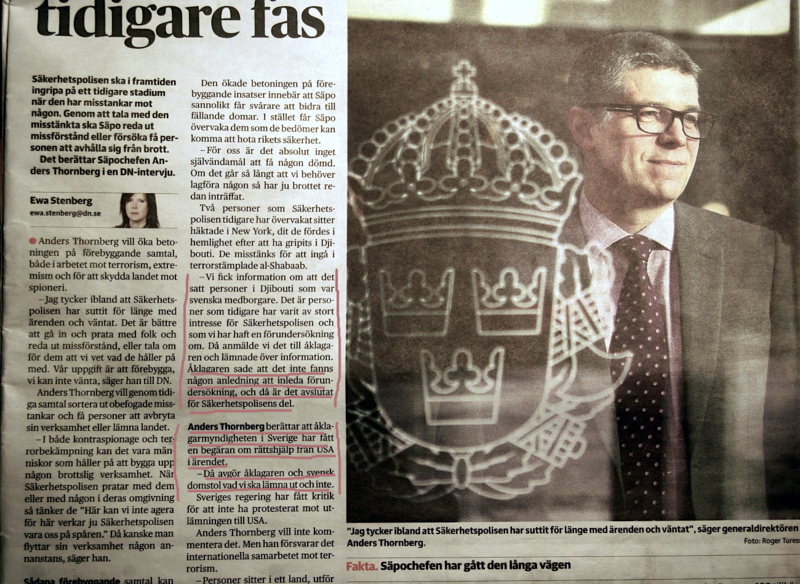 This important event – clearly demonstrating that Sweden was no longer considered a leading country in international HR activity – was not covered by the Swedish public service media and was mostly ignored by the Swedish press, although it was informed by a UN-site in Sweden (United Nations Association in Sweden). This lack of media attention left the Swedish people generally unaware of the change in reputation of their nation, thus limiting the opportunity for public debate and change. To date, none of these facts have been analysed in Sweden against the backdrop of its new human-rights behaviour. This situation has only been exacerbated by the receipt, in June 2014, of a “warning” from the United Nations against Sweden. This UN warning was caused by a disturbing decline of the status of the human rights in Sweden, including racial issues. The publicized international criticism on Sweden regarding human-rights breaches has been split between concrete actions by the Swedish government and “non-actions” by the Swedish section of Amnesty International. One event was the secret collaboration of the government with U.S. intelligent services in the extraordinary renditions of two political refugees in Sweden. These two individuals were transported for detention in Egypt where they were tortured under interrogation. For this, Sweden was sanctioned by the United Nations for “serious transgression” to the torture-ban issued by the UN and previously ratified by Sweden. Another episode was the rendition in Somalia on 14 November 2012 of other two refugees in Sweden. These refugees – after a thorough investigation by the Swedish Security police – had been acquitted in Sweden of any suspicion of criminal or terrorism menace. Even the Swedish Radio and DN reported that the Swedish Foreign ministry knew of the renditions to the U.S. but had not prevented them. Sadly, such exposures of collaboration of Swedish authorities in the rendition to USA of refugees in Sweden continued. As recently as 15 February 2015, Aftonbladet denounced yet another episode of the same behaviour. Another exposed transgression of the Swedish government was the secret collaboration with US agencies, hidden from the Swedish parliament, to transfer the personal information of Swedish citizens. This violation was followed by the promulgation of a series of laws in 2008-2010, at the request of the US government, to enact limitations to civil liberties regarding personal integrity. Most known it was the FRA-lagen (the surveillance legislation) of 2008. The incident above was among those exposed by WikiLeaks in the Diplomatic cables on Sweden, which brought serious consequences to the Wikileaks founder in the US and Sweden. The linkages between those disclosures by Wikileaks and the case of Sweden VS. Wikileaks founder, Julian Assange, has been highly analysed in international HR forums. The article “This is why“, by a member of SWEDHR, references these associations in an interview to a London-based Swedish journalist. WikiLeaks later distributed the post by its channels in social media. Further, SWDHR has reported that, according to the Snowden revelations published by Glenn Greenwald in The Intercept, a prosecution of Assange in Sweden had been requested by the U.S. (in fact, a request made to all countries participating in the military occupation of Afghanistan). An extended analysis of the political background of the case can be seen in the book [available on line for free download] Sweden VS. Assange – Human Rights Issues. The Swedish section of Amnesty International. The Swedish section of Amnesty first became notorious when it took a divergent position versus its own mother-organization Amnesty International. This was not only related to the Assange case, in which the leadership of the Swedish section publicly declared a practical negation of Amnesty International’s support for Assange, but to other cases as well. In May 2014, the Swedish section of Amnesty International voted to reject human-right actions on the cases of Julian Assange, Edward Snowden and tortured Palestinian children. There are a number of other government-official and institutionalized NGOs dealing with HR in Sweden. Most of them, if not all, receive sponsoring and total or partial funding from the Swedish government. The stances of these HR-organizations do not appear to differ in essence with the Swedish government, particularly the former Ministry of Foreign Affairs. SWEDHR is not a part of the activities of such organizations. We clearly declare that our endeavour shall be totally independent from government or any authority or institution, Swedish or international. Further, our action-focus and our area of expertise are unique and different compared to existing NGOs in Sweden. We have no criticism whatsoever to the people engaged in HR activities out of a sincere social compassion and a righteous sense of justice. All those volunteers certainly do a great contribution. In terms of the treatment of human right issues that could be regarded as “sensitive” to the interest of NATO and the wars they support, we can state clearly that our organization SWEDHR is not a complement, but an alternative to, for instance, the Swedish section of Amnesty International. Please be welcome to support this noble endeavour. For the time being we shall begin with an engagement regarding the effects of war crimes on the civilian population of Gaza and East Ukraine. In the reporting of individual cases currently being targeted by governments for the exposure of war-crimes, we will campaign for a rapid solution to the Assange case on the part of Sweden and for the respect of his human right of political asylum. We will struggle for the granting of political asylum in Sweden for Edward Snowden, and we will be active in the release from prison of the Swedish doctor Fikru Maru, who has been held in an Ethiopian jail for 21 months with neither a conviction nor an individual trial. We have also included the monitoring of the prosecution case ordered by the Ukrainian government against the founder of the movement ANTIWAR, Ms. Victoria Shilova, MP at the Regional Council of Dniepropetrovsk. For the “crime” that her organization ANTIWAR would have incurred by distributing leaflets against the civil war and further mobilizations in Ukraine. Swedish Doctors For Human Rights (SWEDHR) is an independent, non-profit, non-partisan, non-government-sponsored, non-government-financed research organization engaged in the reporting on the effects of war, torture and human-rights transgressions in civilian populations or on individuals. SWEDHR is a team formed with the participation of a number of Swedish professors, PhDs, medical doctors and university researchers in the medical sciences and health-related disciplines. This participation is purely voluntary and made on a private basis. SWEDHR statements represent solely the members of this organization, not all Swedish doctors or any other institution or professional/academic association that the participants in SWEDHR are associated with. SWEDHR follows both the United Nations doctrine on Human Rights and ethical norms according to the World Medical Association’s Ethical Declaration of Helsinki. The decisions-process at SWEDHR is democratic and based in first option on consensus among the board members. In second option, if consensus would not be achieved, in the voting of the propositions. Majority of votes holds as conclusive resolution. The same is valid for the assembly of all active members of the organization, when convoked by the board. Updates by International HR orgs.